Get a little pizzazz for summer! With this summery design, you can go so bright and bold that you'll even stand out against the sun! Summer Lemonade is a bold pink with pops of yellow cups of lemonade and green shapes. This is the perfect design for beach and pool gear! 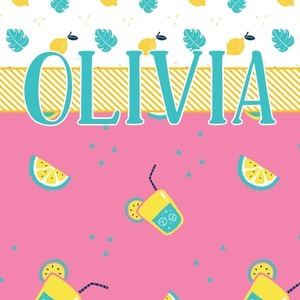 Get some fun flip-flops or put it on a beach towel!